The Rice lab of materials scientist Pulickel Ajayan used an environmentally friendly deep eutectic solvent to extract valuable elements from the metal oxides commonly used as cathodes in lithium-ion batteries. The goal, researchers said, is to curtail the use of harsh processes to recycle batteries and keep them out of landfills. The solvent, made of commodity products choline chloride and ethylene glycol, extracted more than 90 percent of cobalt from powdered compounds, and a smaller but still significant amount from used batteries. "Rechargeable battery waste, particularly from lithium-ion batteries, will become an increasingly menacing environmental challenge in the future as the demand for these through their usage in electric vehicles and other gadgets increases dramatically," Ajayan said. "It's important to recover strategic metals like cobalt that are limited in supply and are critical for the performance of these energy-storage devices," he said. "Something to learn from our present situation with plastics is that it is the right time to have a comprehensive strategy for recycling the growing volume of battery waste." The results appear in Nature Energy. Other processes also have drawbacks, she said. Pyrometallurgy involves crushing and mixing at extreme temperatures, and the harmful fumes require scrubbing. Hydrometallurgy requires caustic chemicals, while other "green" solvents that extract metal ions often require additional agents or high-temperature processes to fully capture them. A deep eutectic solvent is a mixture of two or more compounds that freezes at temperatures much lower than each of its precursors. In that way, she said, one can literally obtain a liquid from a simple combination of solids. "The large depression of freezing and melting points is due to the hydrogen bonds formed between the different chemicals," Tran said. "By selecting the right precursors, inexpensive 'green' solvents with interesting properties can be fabricated." When Tran joined, the Rice group was already testing a eutectic solution as an electrolyte in next-generation high-temperature supercapacitors. "We tried to use it in metal oxide supercapacitors, and it was dissolving them," said Rice research scientist and co-corresponding author Babu Ganguli. "The color of the solution would change." The eutectic was pulling ions from the supercapacitor's nickel. "Our team was discussing this and we soon realized we could use what was thought to be a disadvantage for electrolyte as an advantage for dissolving and recycling spent lithium batteries," Ganguli said. 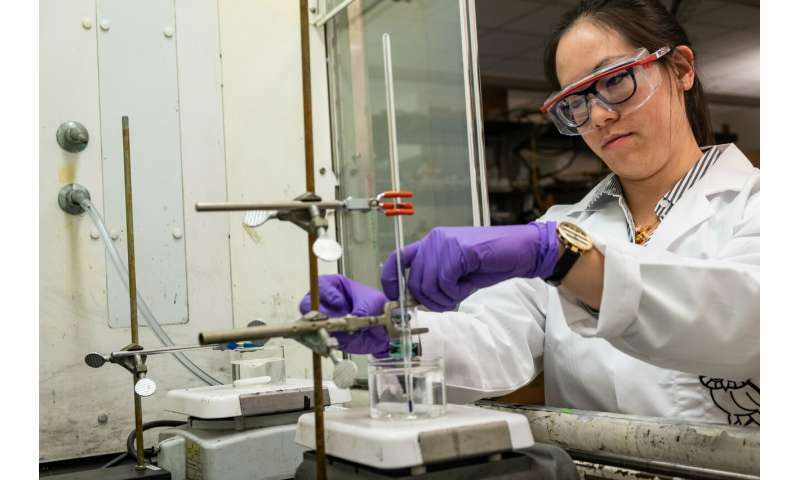 That became Tran's focus, as she tested deep eutectic solvents on metal oxides at different temperatures and time scales. 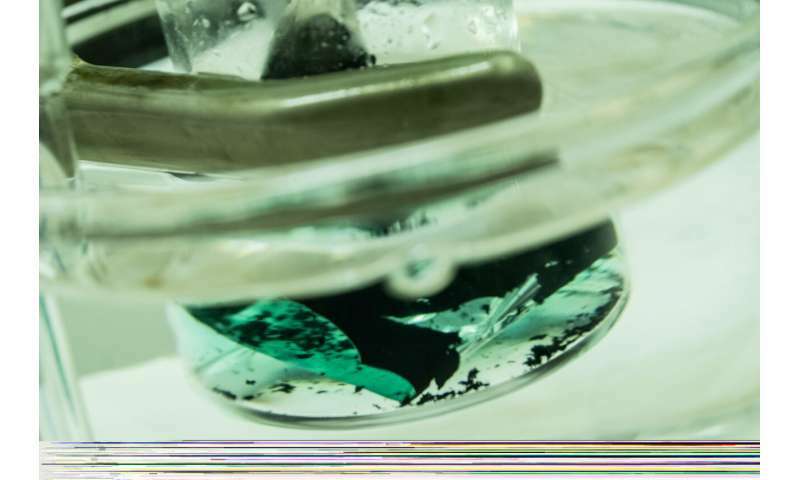 During tests with lithium cobalt oxide powder, the clear solvent yielded a wide spectrum of blue-green colors that indicated the presence of cobalt dissolved within. At 180 degrees Celsius (356 degrees Fahrenheit), the solvent extracted nearly 90 percent of lithium ions, and up to 99 percent of cobalt ions from the powder when certain conditions were satisfied. The researchers built small prototype batteries and cycled them 300 times before exposing the electrodes to the same conditions. 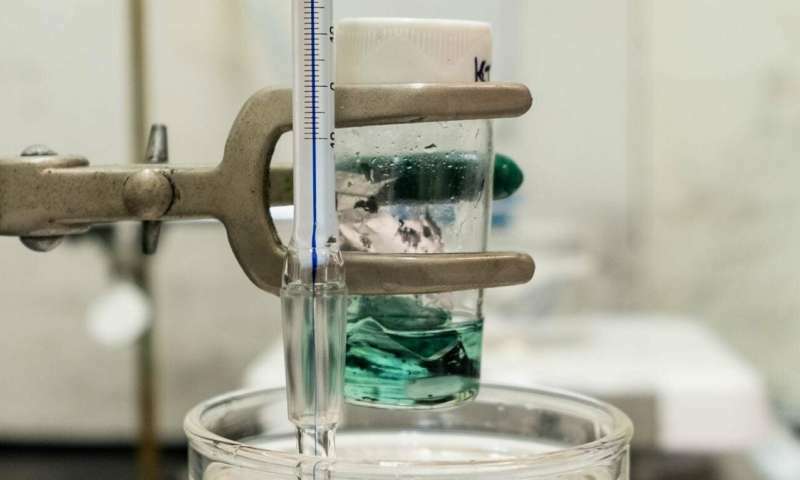 The solvent proved adept at dissolving the cobalt and lithium while separating the metal oxides from the other compounds present in the electrode. They found that cobalt could be recovered from the eutectic solution through precipitation or even electroplating to a steel mesh, as this latter method potentially allowed for the deep eutectic solvent itself to be reused. "We focused on cobalt," said Rice alumnus Marco Rodrigues, now a postdoctoral researcher at Argonne National Laboratory. "From a resource standpoint, it's the most critical part. The battery in your phone will surely have lots of it. Lithium is very valuable too, but cobalt in particular is not only environmentally scarce but also, from a social standpoint, hard to get." He noted the Department of Energy is mounting new efforts to advance battery recycling technologies and recently announced a center for Li-ion battery recycling. The path forward will require continued efforts.